Nasi Uduk Ibu Sum opens daily from 10PM onward, except for Saturday night it's closed. Located at Jalan Mangga Dua, if you're heading from Stasiun Kota then it's on your left, before Pasar Pagi & ITC Mangga Dua. Look for Indomaret on your left and usually you'll find line of parked cars right before it. 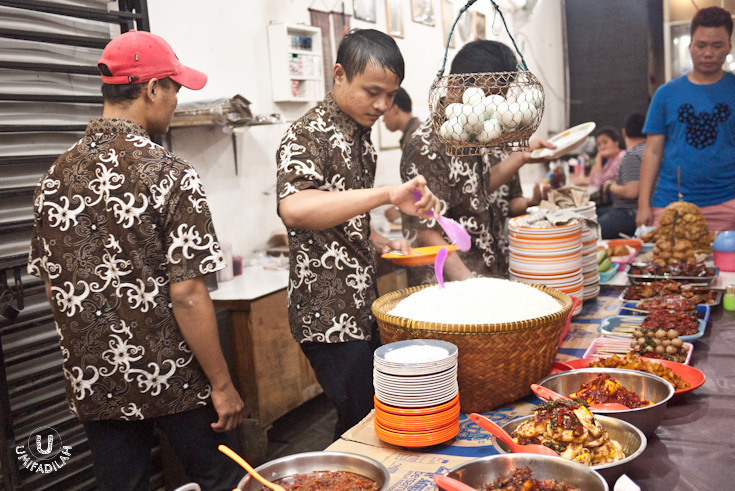 Nasi Uduk Ibu Sum has its own charm especially to the late-shift workers nearby. True that they open at 10PM, but you can actually see people lining up from 9.30PM-ish although they haven’t even turn on the lights yet. So imagine this: it’s dark, but people already starting to fill in the long benches, and the vague aroma of coconut milk and spices from its infamous Nasi Uduk just makes them hungrier than ever. This happened to me. Around 10PM sharp, lights were lit simultaneously, and the employees whose wearing batik uniform were getting dozens of dishes in various container shape – big bowl & basin, pot, trays – out to the L-shaped serving table. Yes, buffet style but it’s still their job to measure each serving. Your job, is to pick whichever side dish for the Nasi Uduk – and let me tell you: It’s never easy because if you’re quite an omnivore like me, you have to hold yourself from that gluttony of wanting to order everything. LOL! From fried chicken, rendang, fried beehoon, fried noodle, sambal teri/kacang/tempe (spicy dried anchovies/ground nuts/crispy soybean-cake), large cuttlefish, eggs done different way (omelet, sunny side up drenched in sambal balado, hard-boiled, semur, pindang, salted egg, quail egg satay, etc) to offal selection of tumis kikil (sautéed cow's knuckle), gulai otak (cow’s brain stew), braised beef, even jengkol stew etc; and not forgetting the tongue-burning chili condiments and hot-from-the-fryer crispy bakwan, tempe, and other fritters – There are over 34 dishes to choose from! Overwhelming. And I heard their Lontong Sayur (rice cakes in light curry-like broth with so much vegetables and proteins) is also tasty! What I ate that night: Nasi uduk, spicy dried anchovies (sambal teri), tumis kikil, stewed tofu in soy sauce (hidden under the prawn crackers :p), sambal terasi, and vegetable bakwan fritter. Man, now I’m hungry. And it’s far from 10PM. And damn Mangga Dua is way too far :( Can someone please replicate what Ibu Sum did and do it in Bintaro instead? *sigh *desperation of wanting to eat a proper Nasi Uduk meal. Anyway, prepare around IDR 15.000-35.000 depending on what you eat. Not exactly that cheap, but for me it's still worth the price tag because at the end of the day, this is a streetfood, done the right way. Well executed and satisfying. Easily become my favorite around Kota/Mangga Dua area. Do give it a try! Opening hours: 10PM every night except for Saturday night it’s closed.